If you’re like most, you entered the field of HR to help people and empower them to do their best work. So, it can be frustrating when the majority of your day is spent on files, forms, processes, policies, workstreams—you get the idea. The good news? It’s possible for HR to spend less time on administrative tasks and more time building a people-powered workplace. What’s a people-powered workplace? It’s one where employees are happy, productive and engaged in their day-to-day work, which leads to tangible business results. At a time when HR is expected to be more strategic, this contribution to the bottom line is invaluable. 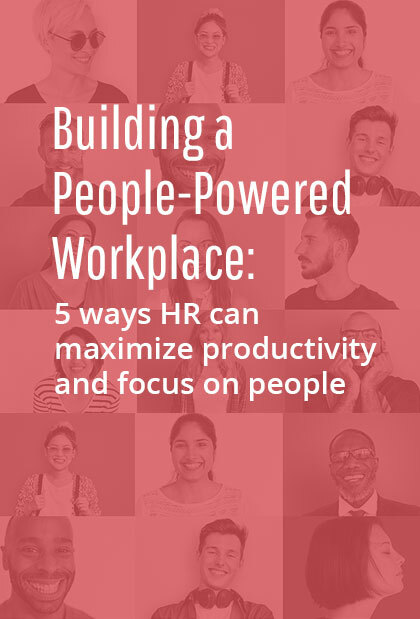 Uncover 5 ways HR can be more productive by spending less time on busywork and more time on people work. Download our interactive eBook today! 68% of HR leaders say their function spends too much time on administrative tasks. Start building a people-powered workplace today!